An article about Kent Weeks's most recent research at KV5, the largest tomb in the Valley of the Kings, and the skeletal remains of some of those interred there. A lengthy article discussing the myths surrounding Cleopatra VII and in particular her death by the bite of an asp. It is easiest to read in "print" format, but if choose to read it as it is presented on the screen, don't forget to click for the "next page" - this article covers four pages. to preserve historical monuments in Sinai. opposition, Egypt's chief archaeologist told parliament Monday". A Spanish team working at Ihnasia (Heraclopolis) have uncovered a cemetery that includes several tombs belonging to statesmen, the most important of which belonged to the supervisor of farms and carrier of the seals of Lower Egypt, named Khete. The tomb was apparently also used for the burial of his wife, Merit, who was the king's hairdresser. Thanks to Tony Cagle's blog for the link to this PDF which describes how combining modern technology, geology and history has cast new light on the spatial distribution of tombs in the Theban Necropolis. The heart of the project is satellite imaging, which provides information not only about known structures, but about architectural features beneath the surface. At the moment the project is focusing on Sheikh Abd el-Qurna hill, where private tombs of noblemen are found, and has recorded over 500 tombs in its database, which can be accessed at www.cofc.edu/olgis . Analysis of existing tombs is also being used to predict the location of lost tombs. A fascinating project for archaeology as a whole. A PDF paper discussing what should go into creating a virtual reconstruction of cultural heritage site, as a tool for Cultural Resource Management. They conclude that reconstructions "must be built on the questions the archaeologists want to answer", and discuss what some of these questions are and how they are best addressed. Dating to the last years of the Old Kingdom, publication about this fortress is expected to reveal information about events taking place at this time: "The existence of the fort, and its short-term occupation, supports a theory popular among Egyptologists that ancient Egypt's war in the Sinai as well as with the Nubians in the modern Sudan was an important factor in the collapse of Egyptian civilization by 2200 BC." The findings were reported at ICE9 in August by the project director, Gregory Mumford, and will be published in the Bulletin of the American School of Oriental Research. More on the 13th Dynasty sarcophagus found at Luxor's Dra'a Abul-Naga necropolis, next to the remains of King Nub-Kheper-Re Intef's brick pyramid. Page to the bottom of this Newsreel page to find the article, which has a much better description of the sarcophagus than previous articles. More details about the much-reported news that the body of Tutankhamun is going to be examined by CT scanning. "The exhibition at the Art and Exhibition Hall in Bonn opened on 3 November and is currently the highlight of the city. It will continue until 1 May. Streets, shops, the airport, railway stations, buses, hotels and restaurants are adorned with posters featuring the famous gold and faience head of Tutankhamun. The boyish face of the legendary Pharaoh is on several magazine covers, while objects from the collection appear on the front pages of all the newspapers. Even gift shop showcases have been cleared of their usual autumn displays and restocked with Tutankhamun souvenirs or posters." (Al Ahram Weekly). Click on the link for more. A Reuters article saying that the mummy of Tutankhamun is to be removed from its current location in the tomb to undergo DNA testing, which might answer a number of questions including how the young king died. An article discussing the Discovery Channel's programme about a skull from KV5. Kent Weeks has apparently suggested that it might be belong to the firstborn son of Rameses II's , who may either have been killed during the 10th plague described in Exodus, or could have met a violent death - suggested by the state of the skull. It is all very speculative, ornamented with scientific tests of various types, which is what you would expect from Discovery. Worth a look. German archaeologists have discovered a rare wooden Pharaonic sarcophagus in Luxor, dating to the 13th Dynasty. At 2.7m long, 1.5m high and 1m wide is is vast. A hieroglyphic inscription on its face revealed that it belonged to an official called "Amni but appears to have been used by his wife. No details are given as to where in the Luxor area it was found. 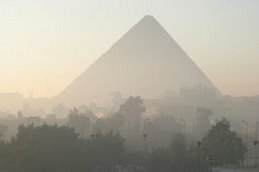 By analysing tar from different areas in Egypt and the Near East, a Texan team have managed to identify the origins of tar used for sealing mummies in Egypt, helping to suggest trade routes operating around 3000 years plus. An article discussing Okasha El Daly's research into the work of medieval Arabic scholars, comparing their findings and views with those of modern Egyptologists. They take differing perspectives about Cleopatra as an example. "The robot experiment inside Cheops Pyramid in Giza will be repeated next year but this time by a different institution, said Chairman of the Supreme Council of Antiquities, Zahi Hawas." The article reviews, in brief, the previous attempt, but does not give any idea about what will be different about the 2005 attempt (scheduled to take place in October). "The giant statue of Ramses II will finally say farewell to its current noisy, fumy and bustling location in Cairo's most crowded square to rest in the Giza Plateau's Saqqara area, said Zahi Hawas, Chairman of the Supreme Council of Antiquities". Treasures from the Tutankhamun collection (and items from the reign of Ahkehaten) are on display at Bonn in Germany, having completed yet another stage in their European journey. The article reports that during its stay in Basle in Switzerland, it attracted so many visitors that there were queues hours long. An article in the UK Guardian broadsheet about Kent Weeks and his work in the Valley of the Kings. It discusses the Theban Mapping Project, the discovery and excavation of KV5, and Ramesses II and the identity and role of his sons, particularly after he had declared himself a god. "CT is an indispensable imaging tool in the evaluation of Egyptian mummies because it can noninvasively generate large amounts of data. We applied current CT imaging and postprocessing techniques to methodically survey the head and skull base features of nine Egyptian mummies in the hope of providing paleopathologic and radiologic information." Conclusions: "The systematic evaluation of the head and skull base of mummies with CT can provide insight into the life, disease, death, and postmortem treatment of these ancient Egyptians"
This is a good article with images and analyses. The EEF news update points to a new online translation of Herdodotus on Egypt. An extensive and multi-faceted project is being launched to use new and existing technologies and Culture Heritage Management learning to improve the conservation and user experience at the Valley of the Kings. Everything from replacing the tarmac roads with polymer sprayed surfaces to mimic the valley surfaces to limiting tourism and deflecting flash floods are being considered. This is a good article.